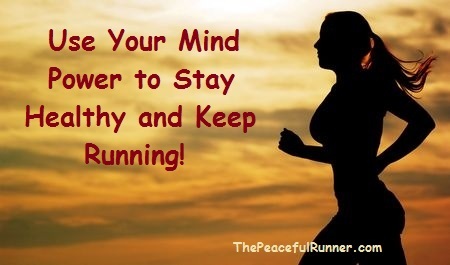 Welcome to this month's newsletter -- Use Your Mind Power to Stay Healthy! 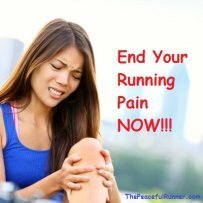 This topic may not seem like it is related to running, but there is a question at the end that will hopefully give you something to consider as to how this may be applied to running. I hope you enjoy this issue. If you do, please share it with your friends or relatives, especially those who tend to be sick often. Yes, you can learn how to use your mind power to stay healthy without medications or supplements! Are you often plagued by headaches, colds, influenza, sinus infections or other common illnesses that keep interfering with your running and training programs? These illnesses used to be a big problem for me, but not anymore. As a child, I was hospitalized with pneumonia so I very much seemed to be prone to respiratory illnesses, especially bronchitis and sinusitis. About three years ago, I came to the realization that I was actually creating these illnesses myself with my thoughts. Yes, it is true. Whenever I "came down with something," I could look back on my thoughts and I could see that there was something in my life that I was resisting or I wasn't happy about. It could have been something like a job I didn't want to do, moving house, or even something simple like wishing the weather or a certain situation was different. Whatever it was, my thoughts were very negative and I was resisting what "is" or what was at the time. This was a huge revelation to me, but it also made me realize that if I could create these illnesses then I could also prevent them. So I began to explore and pursue ways to keep from getting sick so often. I am happy to say that I have found a way to keep from getting sick using mind power alone that has kept me well for nearly three years. Keep reading to learn how you can too. A Course in Miracles teaches us that, "The mind makes all decisions that are responsible for the body's condition." If you agree with this principle, then you know it is possible for us to prevent illness in our bodies. We must develop a strong awareness of what our thoughts contain. Positive high frequency thoughts will generate favorable conditions in our bodies and negative thoughts result in negative low frequency energy that will create negative conditions in our bodies. Most conditions in our bodies have been created by our thoughts. We are the captain of our ship and we have the power to prevent most illnesses. Remember that if an illness can arise quickly and easily in the body, it can also quickly and easily subside. If we can create these conditions, then we can prevent them as well. I have used the following method for almost three years and I have stayed healthy since then. I continue to use it today whenever I start to feel that I may be "coming down with something." Whenever you feel like you are getting a cold, flu, sore throat, headache, etc., start this mind power practice immediately. Do it for about 2 minutes each time and repeat as necessary. Stop whatever you are doing and give the sensation you are feeling your full attention. Say, for example, your throat feels sore. Close your eyes and explore what you feel there with a curious mind. Try to locate exactly where the soreness is in your throat. Try to find the center of the pain. Keep digging with your mind. Feel the pain fully and without any resistance. Focus and really be present with what you are feeling. All pain wants to be felt. Stay calm, continue to explore and send loving kindness to the sore/achy area. Feel what you feel and let it be as it is. When you stop resisting pain and give it your attention, you create space around it which allows energy to flow through the area rather than keeping it stuck where it can fester and grow. Feeling pain is part of the process of reconnecting with and developing a strong relationship with our bodies. The more we practice being present with pain and uncomfortable conditions and allow them to be, the closer we become to achieving a higher state of mind in which we are able to let go of the desire to be rid of pain. Sometimes just doing the practice above a few times may alleviate the condition. However, more often than not, you will need to do it much more often. Pain speaks louder at some times during the day than it does at others. Be sure to do the practice when it is speaking loudest to you. This will require discipline as we often don't want to stop what we are doing. We want to get it done and move on to the next thing. However, it is important to give your body the attention it needs when it needs it. The pain will call to you when it wants more attention. Continue to give it attention as often as it asks. Have confidence in the process and your body's ability to heal itself. When your body is in this low energy frequency, it may also help to repeat a high energy affirmation that affirms your love and forgiveness towards yourself. My favorite is: "I deeply and completely love and accept myself." Repeating this affirmation will help raise your healing energy level. Continue to repeat it as part of your practice until your feel well again. 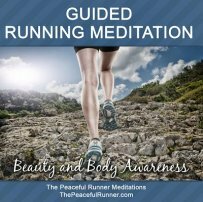 For more uplifting affirmations checkout the 10 Most Powerful Affirmations for Runners. So will I ever get sick again? I hope not but life is a constant learning process. I may go through a period whereby I may not be able to keep my vibration energy level high enough to stay well and you may have the same experience. It is during these times that we must recognize our flawed human nature. We will not always do everything perfectly and it is during these times that we need to be the most kind, gentle and forgiving with ourselves. I hope you will use your mind power to stay healthy the next time you start to feel like you are "coming down with something." It really works for me and I believe it will work for you too. Please give it a try and come back and tell us about your mind power experience in the Comments below. Or maybe you have a different technique that you use to stay healthy without medications or supplements. We would love to hear about that too. 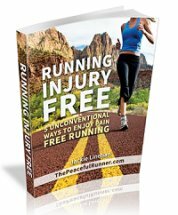 Running related question: Do you think that this practice can also be helpful in preventing running injuries? What do you think? Please add your Comments below.